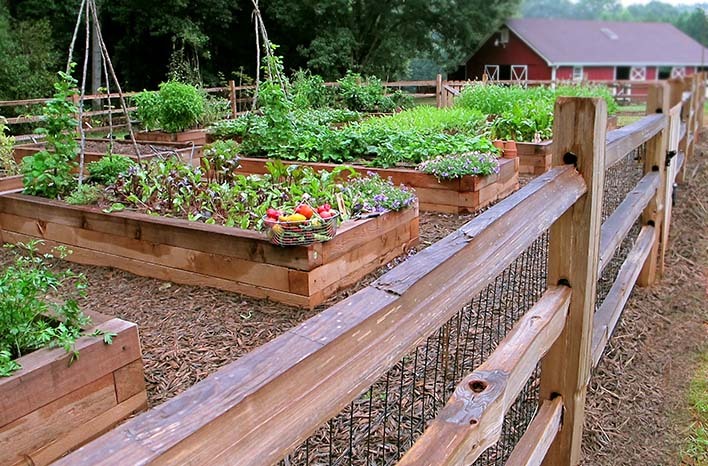 Raised beds offer many benefits for productive and efficient gardening. It’s certainly my method of choice. Height: 12-18” is ideal, however even as low as 6” can work and be productive. 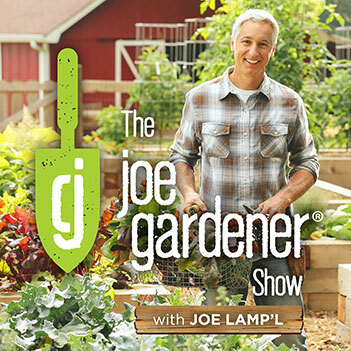 If you listen to my podcast series, The joe gardener Show, you may have already learned that an 18” depth is also the perfect height to provide extra seating for small space gardens. Width: Four feet is perfect, but three feet can also work. Four feet allows more flexibility for spacing rows, but more importantly, not building beyond that width will allow you to easily reach the center from either side of the bed. Length: Whatever fits your needs. As long as you stick within a four foot maximum width, your length is only limited by your space and budget. Shape: You can build squares, rectangles, T’s, circles, ovals, etc. As long as you can reach all areas of the bed from the edge (staying within that four foot width), you’re all set. The raised beds at the Garden Farm™ are three or four feet wide and twelve feet long, but you don’t need this much space to use a raised bed. Versatility in size and construction are key reasons that raised bed gardening is such a great option for gardeners in all situations. The materials you use to contain your raised bed garden can be purchased or upcycled. Wood, galvanized metal, concrete blocks, bricks, stone – there are so many options. There are also benefits and drawbacks to each option. Remember – the materials you use will be in close quarters to your food crop, so selecting responsibly is important. I did the research on many of these options and provided some details in my recent podcast series on Raised Bed Gardening. So I invite you to check that out and learn how to avoid any health risks. 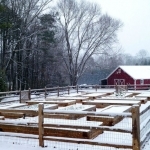 Bare ground is not a requirement in raised bed gardening. 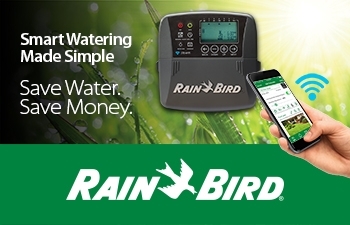 If all you have is a cement pad, a patch of driveway, an area of gravel – no problem. I have seen many home and community gardens built on parking lots, sidewalks, etc. If this is what you have to work with, then go for it! These can be productive garden locations too. The key to building on hardscape, is drainage ability. Water should be able to flow out of the bottom of your raised bed onto the concrete. Some people layer cardboard beneath the bed structure to help with water retention, but that cardboard will break down so quickly it’s really not a worthwhile step. 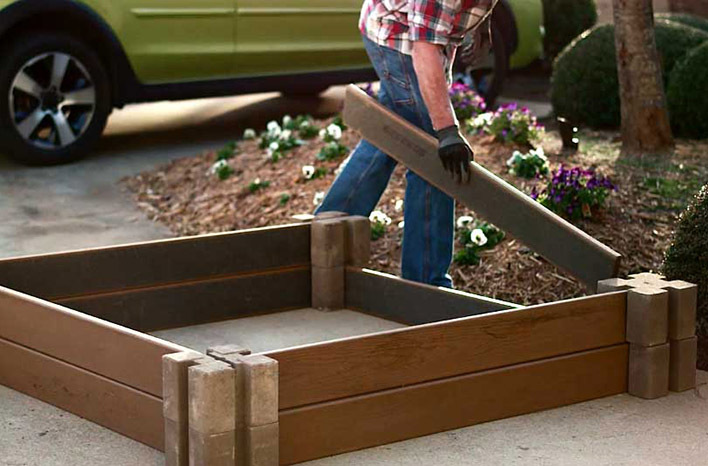 Raised bed kits can be a quick and inexpensive option. These materials are available at most home improvement centers. 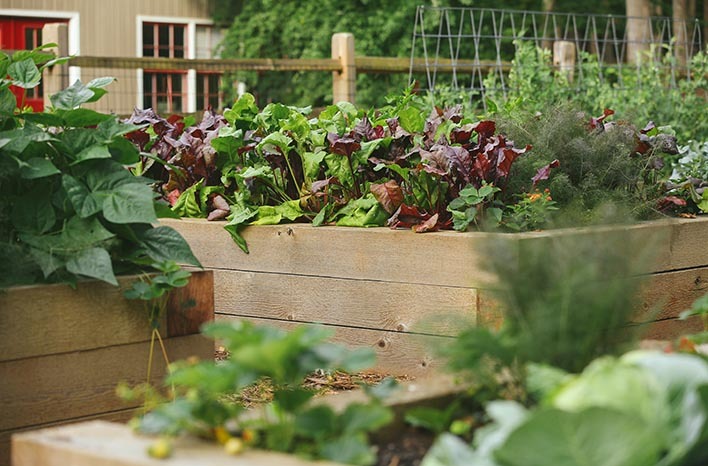 Raised beds can put plants at eye level for better observation of pest issues. 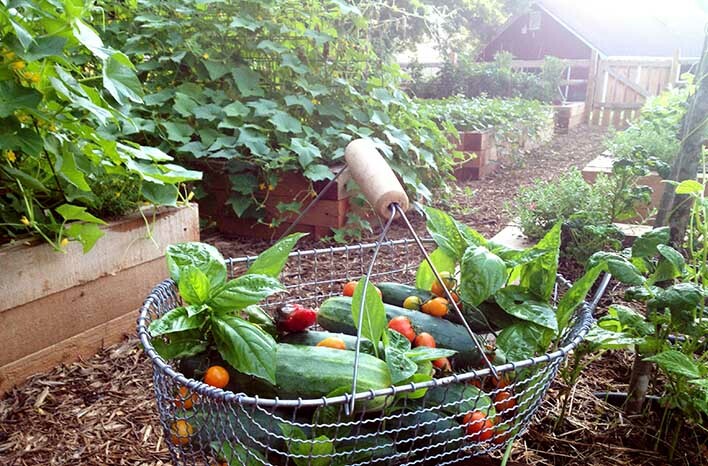 It’s also easier to harvest, prune, and get after weeds in a raised bed garden. When the bed is contained in a structure, you are better able to really get in there and work your bed without impacting the overall shape. I also prefer not having to bend over to maintain the beds. 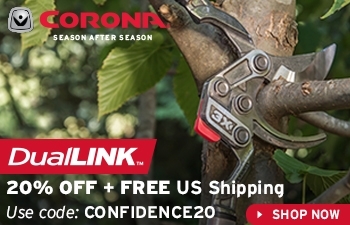 Just that little bit of added convenience makes it easier to work in the garden, even on those days where I might be tempted to just kick back with a cold beverage. Believe me, I have those days too. Let the record state that I am not a control freak, but when it comes to my soil, I am all about micro-management. 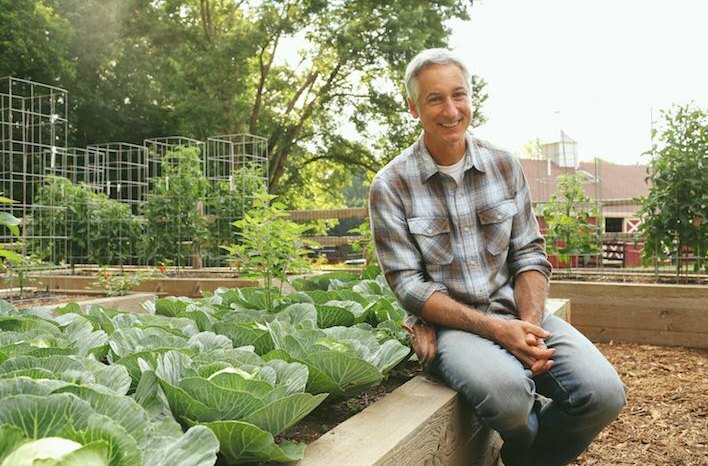 Through my horticultural education and my many years in the garden “trenches” – I’ve learned that garden success is made or lost in the soil. Soil is the anchor in which you secure and feed your plants. The soil, itself, doesn’t really feed the plants in the commonly-understood sense. Instead, soil is the environment that promotes a healthy ecosystem below the surface – that can facilitate (or hinder) the ability for air, water and nutrients to be utilized by plants and their roots at an optimal level. In a raised bed format, I can engineer my raised bed soil to maintain proper hydration and create an environment that sustains a myriad of life, called the soil food web. A healthy soil food web is busy with billions of microscopic organisms as well as larger creatures, like earthworms, all working together. A soil food web is complex, but in the contained space of a raised bed, you can build that healthy ecosystem. Healthy soil promotes the processes of nutrient development and delivery (to plants). In other words: Don’t feed the plants. Feed the soil, so the soil can feed the plants. Rich, healthy soil is built. 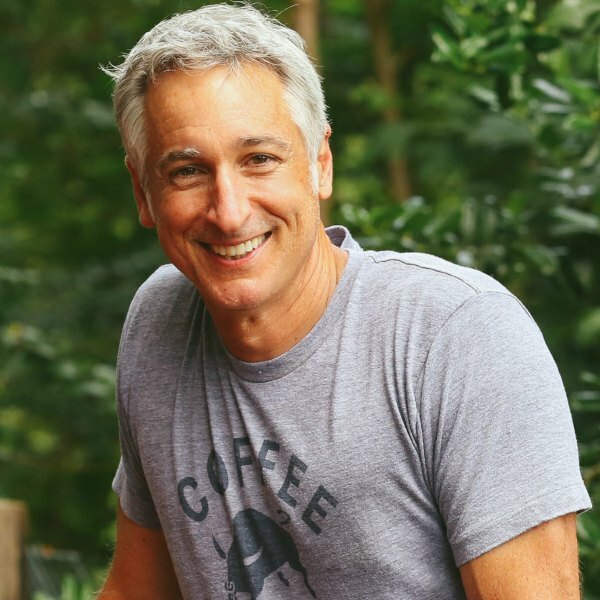 I’ve developed my “recipe” of quality topsoil and organic ingredients through my years of gardening experience and consultation, and it’s productivity (maintained with yearly amendments) has stood the test of time. How do I build a healthy growing medium? Over the years, I have developed the ideal soil “recipe” to get raised beds off to a rich and robust start. I use a mix of organic material to create a diverse blend. 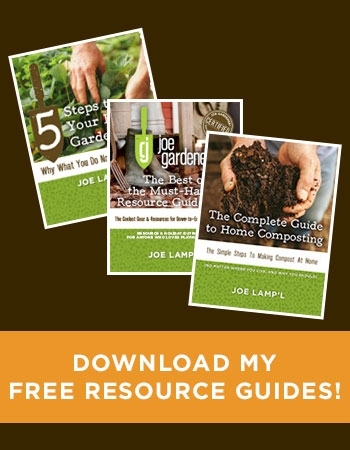 The full recipe, along with several organic amendment recommendations and tips to avoid common ingredients which may poison your plants, is included in my free guide. 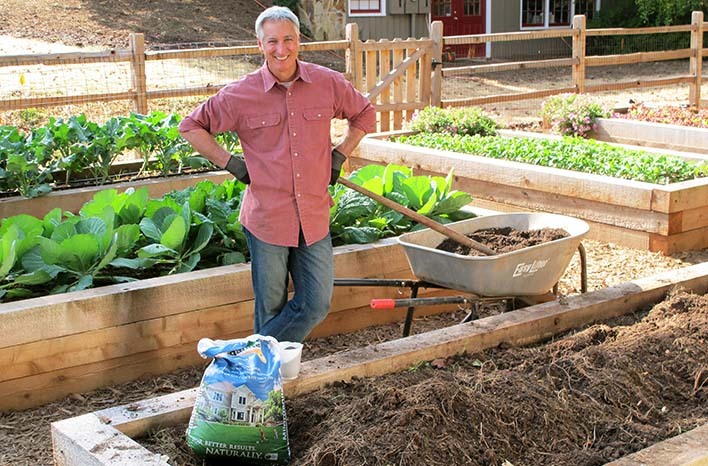 50% high-quality topsoil: This makes up the bulk of your bed. Purchase topsoil in bulk or bags. If you purchase in bags, buy a trusted brand and look at the ingredients, which will often be regionally-sourced. If you’ll need over a half pickup truck load, I suggest buying in bulk. Take the time to talk with the supplier. Ask questions as to what goes into making their topsoil. I even go so far as to inspect it. 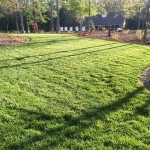 It’s not that uncommon for suppliers to provide fill dirt as “topsoil,” and you don’t want to start your beds with fill dirt. 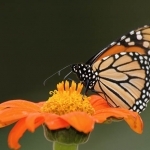 30% high-quality homemade or Certified compost: The U.S Composting Council encourages all gardeners and growers to “strive for five.” This refers to the goal of making the organic matter in your soil 5% of the total (by weight). The rough estimate to make that 5% happen is to include organic material of about 30% by volume to the total. It’s very likely you’ll need to purchase compost beyond what you make. Not all compost is created equal. An easy way to play your compost purchase safe is to find a supplier that offers Certified compost, as deemed by the U.S Composting Council. 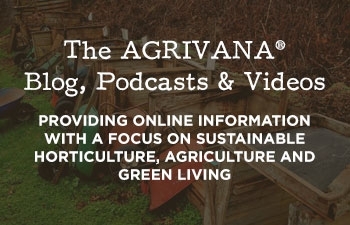 Their website offers some solid advice and a database of composter members. 20% organic ingredients: Think of the last 20% as a cocktail, and it’s up to you to concoct your signature mix. There are many great organic mediums you can select from. I list six of my favorites in my free guide. I really like the results from selecting four amendments and adding approximately 5% of each. 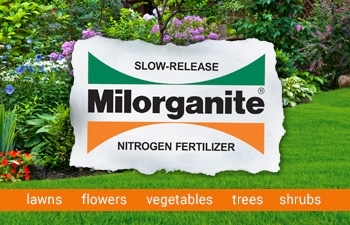 Once those ingredients are blended together and you’re raised beds are filled, as a final step consider adding some slow-release, non-synthetic, nitrogen-based fertilizer; like Milorganite®; to the mix. It’s like the dash of cocoa powder on a great latte – adding a little extra kick to feed your soil and ensure robust plants and a booming crop. So there you have it – my Top Five reasons for gardening in raised beds. 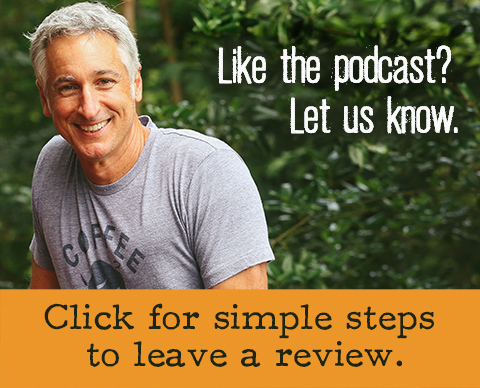 In my podcast series, I also detail how to prepare your garden site, deal with pests, maintain healthy soil in seasons to come (or rejuvenate tired soil in existing beds), and lots more. All the information you need to get growing is there. Building the raised beds at the GardenFarm was a real investment. If you don’t have the budget to build more than one bed this season, start small and do it the right way. 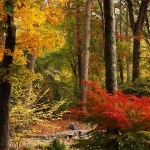 Then, build on that garden dream in the seasons to come. 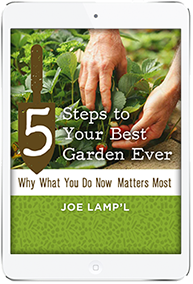 The great results you’ll have when you invest in soil health will make that larger garden experience worth the wait. If you are restricted by budget, there are places to save – such as upcycling material for construction – but your soil is not the area in which I recommend cutting corners cost-wise. Building one bed well is better than building four beds poorly. Starting small can also help you better adjust to the tasks of properly tending your plants and teach you how to do better the next time. 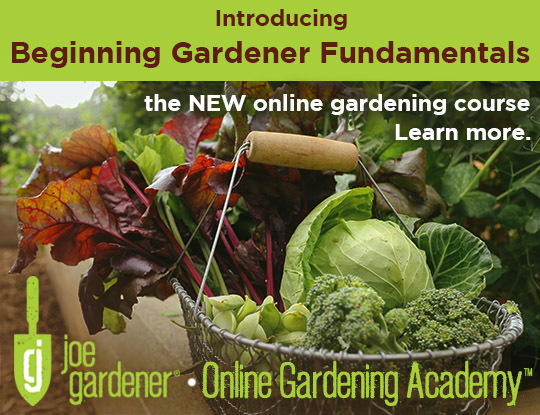 Expanding your garden in a coming season or two will allow you to make the best use of your budget and practices you learn this season. One thing I learned early on is that you get what you pay for. Your biggest investment is in your soil. 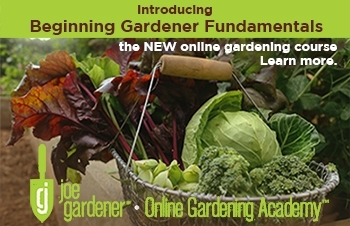 The health of your plants and success of your crop depends on it.